Pursue your writing in an environment that provides maximum opportunity for personal exploration and growth. Bring along a work-in-progress (scholarly and/or creative). Bring a desire to write. Experiment with new ways of writing – short stories, poems, personal essays, or narrative nonfiction. Use reflection and writing to better understand professional challenges, patient interactions, and ethical dilemmas. We integrate wellness activities into the programming with optional morning walks, movement and meditation practices, individual wellness coaching, and afternoon and evening sessions exploring ways to increase resilience and meaning in our clinical work. Mornings from nine to noon, participants meet in the graceful Luhan House classroom to write alone and with each other, to read and discuss poems and literary passages, and to discuss various aspects of writing. Afternoons are free for scheduled writing and/or wellness consultations with faculty members, for optional small group meetings, and for solitary writing, reflection, and communion with the beauty of Taos. Evening gatherings include readings, videos, and wellness sessions. The opportunity for reflection, writing, and self-care in this beautiful Northern New Mexico setting is unique. Participants are relaxed and energized. The interactions with fellow writers, gorgeous surrounding, fabulous food, and spontaneous encounters create a magical synergy. CME credits (22.0 hours) available for physicians, physician assistants, and nurse practitioners. Pieces written at the 2019 retreat will be invited for submission to the Permanente 'leaflet'. Registration includes six nights lodging (attractive private room with bath), three gourmet meals per day,all workshops and individual sessions, evening programming and materials, and trip to the museum. A spouse or adult companion may share the room and participate in wellness programming for additional fees. A non- refundable deposit of $760.00 will secure your reservation. Registration is limited to 16 people for this retreat. Advance registration is encouraged. Register early to avoid disappointment. Due to limited enrollment, your registration will be confirmed. Please confirm your registration before making travel arrangements. Registrations paid in cash must be in the exact amount of tuition. CME does not maintain a petty cash fund. It is UNM policy to charge $35.00 plus normal merchant bank fees for each returned check. Make check payable to: UNM Continuing Medical Education & Professional Development and mail it along with registration form to: UNM CME, MSC09 5370, 1 University of New Mexico, Albuquerque, NM 87131-0001. To pay by credit card, visit the conference registration site. Your registration will be confirmed by email. UNM CME no longer accepts POs or faxed registrations with credit card information. If you cannot attend, Continuing Medical Education & Professional Development will refund tuition, less a $40.00 administrative fee, provided it is received in writing on or before July 17, 2019. No refunds will be issued after this date or for non-attendance. Conferences are subject to cancellation. In the event this conference is cancelled, UNM CME is not responsible for any airfare, hotel, or other cost incurred by participants. All eligible UNM Faculty and Staff may enroll using a UNM Tuition Remission Form to cover partial tuition costs listed on the registration form. PLEASE DO NOT USE THE ONLINE REGISTRATION SITE. A copy of the UNM Tuition Remission Form, along with a copy of the conference registration form, need to be emailed to HSC-CMEWeb@salud.unm.edu or faxed to (505) 272-8604. The UNM Tuition Remission Form can be found here: https://hr.unm.ed/benefits/tuition-remission. The conference registration form can be found on the right side of this page (click “Download the Brochure”). Proper completion includes all required signatures. No refund or credit will be issued for non-attendance. Mornings from nine to noon, participants meet in the graceful Luhan House classroom to write and to discuss various aspects of writing. Afternoons are free for scheduled one-on-one writing consultations with faculty members, for optional small group meetings, and for solitary writing, reflection, and communion with the beauty of Taos. Wellness sessions will include morning meditation, one-on-one wellness consultations with Dr. Lawrence, and an afternoon and evening session. Evening gatherings include readings, movies, and wellness sessions. Check-in at the Mabel Dodge Luhan House is any time after 3:00 p.m. on Sunday, August 4, 2019. Dinner will be served that evening and an orientation session for participants will be held after dinner. Participants are encouraged to stay through Friday, August 9 for evening reading of participants’ writing. Please note your room is booked through Friday night. The last scheduled meal will be breakfast on Saturday, August 10 with check-out at 10:30 am on Saturday. The price of the Retreat includes the cost of your room at the Mabel Dodge Luhan House, all meals and afternoon snacks. Rooms are assigned. Please let us know ASAP if you will bring a spouse/adult companion and if you require a ground floor room. This information may affect room assignments. Rooms are similar but not identical. Non-standard construction is among the pleasures of the Mabel Dodge Luhan House, but it means that we cannot guarantee a specific room. We do our best to match available rooms with the special needs of participants, so please let us know if you have special needs. Please bring your own personal supplies such as hair dryers, shampoo, etc. Taos is approximately a three-hour drive north of the Albuquerque airport (called, officially, the Sunport). Whatever route north you take; you will eventually be on the one main road into Taos (Route 68). As you pass the outskirts and shops thicken, the road narrows and winds uphill. At the plaza stoplight, turn right on Kit Carson Road (US 64). Two blocks down Kit Carson Road, turn left on Morada Lane. Turn left again at the end of the paved road and enter the gravel parking lot for the Mabel Dodge Luhan House. The main house, where you check in, is up a flight of wooden stairs between huge cottonwoods. Check in at the reservation area through a door off the living room in the main house. Anyone who wishes to take a bus to Taos from the Albuquerque airport can make reservations and get information from Twin Hearts shuttle service at (505) 751-1201. Our rooms at the Luhan House will be available after 3:00 p.m. on Sunday, and you are welcome to check in any time after that. The staff asks that we not arrive early. There is a very informal wine-and-cheese gathering at approximately 5:00 p.m. in the lobby of the Luhan House, and dinner will be served in the adjacent dining room at 6:00. At 7:30, we gather in the classroom for a brief orientation followed by the evening gathering. Dress is always casual, which means you should wear whatever you like. Shorts, jeans, tee-shirts are fine. Comfort rules. Bolos optional. Breakfast, lunch and dinner are served family-style at the Luhan House dining room, and each meal includes options for vegetarians. Please let us know if you have particular dietary needs. There are no phone connections in the rooms at the Luhan House. In the main house, there is a phone from which you can make local and credit card calls. During working hours, a staff member usually sits at the Luhan House reservation desk and can take incoming messages. If you need to check e-mail, a wireless Internet connection is available most of the time in the lobby of the Luhan House but not elsewhere. We will have a laptop PC connected to a printer available for your use throughout the retreat. Printing options include: working on the Retreat laptop and printing directly from there; hooking your laptop up to our printer; using a flash drive with our laptop/printer. We strongly suggest bringing a laptop for your own writing, and a flash drive for printing. There is no Internet access in the classroom. You do NOT need a computer for the morning classroom sessions, where we display a strong bias toward paper-and-pen. It's a mountain town, at 9,000 feet. Summer weather is variable, often cool in the morning, hot in the afternoon, cool at night. Thunderstorms cruise in abruptly. Be prepared for hot, cold, wet, dry - sometimes all in the same day. Our last full session is Friday evening. It ends late, so please plan to stay through Friday night if at all possible. Saturday breakfast is served. Check out time is 10:30 am. All questions about retreat logistics should be addressed to Tisha Aldredge, CMP at Taldredge@salud.unm.edu or (505) 272-0883. For questions about content of the retreat, contact Liz Lawrence at Elawrence@salud.unm.edu. Pamela Arenella, MD is an Associate Professor at the University of New Mexico’s School of Medicine. She is the Vice Chair for Education and the Program Director for Residency Training in the Department of Psychiatry. In her role as Program Director and Vice Chair, she is actively engaged in educational program development for the Department and mentoring both trainees and junior faculty in pursuing their scholarly endeavors. She is also board certified in Addiction Medicine and works as an attending clinician in the Dual Diagnosis Clinic at the UNM Alcohol and Substance Abuse Program and in the UNM Psychiatric Consultants Clinic. As an addiction specialist, she has worked extensively with patients that are involved with the New Mexico Monitored Treatment program for impaired clinicians. As a result of this work and in her work with trainees, she has become interested in the study of wellness and resiliency, and has recently taken on a position as the Director of Humanities and Creativity in the Office of Physician and Student Wellness. Daniel Becker, MD retired from the University of Virginia School of Medicine on July 1, 2018. He was rehired on October 1, part time, to teach medical students clinical medicine. He has wanted to be a writer since learning to read, and in order to make meaning (rather than sausage) out of his clinical and teaching experience, he started writing seriously in the late 1990s. Along the way he picked up an MFA, which didn't teach him how to write (we teach ourselves) but did teach him it was both fun and useful to take a week off from real life and spend that time talking about writing, hanging out with writers, writing, and wondering how the sky got so blue. 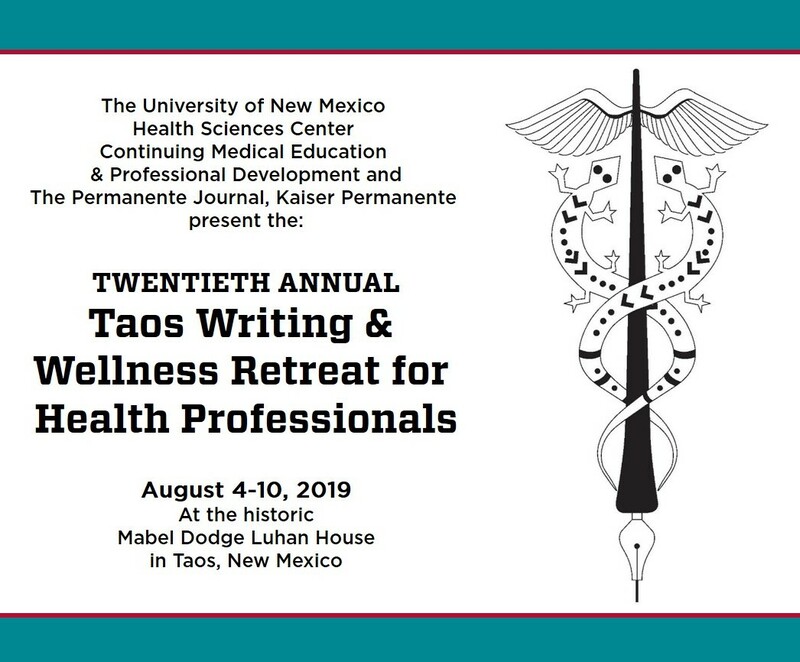 As at the Taos writing retreat for health professionals. As well as poems, essays, and stories in clinical and literary journals, he has a chapbook of poems, Chance, and a book of poems, 2nd Chance, looking for a publisher. Liz Lawrence, MD, FACP is an Associate Professor in the Department of Internal Medicine at the University of New Mexico and Director of Physician and Student Wellness at UNM School of Medicine. In her wellness role, Liz is developing and implementing curricula to enable medical students to identify strategies and tools to maintain their wellness and is working on several UNM initiatives to prevent and treat burnout for faculty and learners. Liz believes strongly that clinicians must take care of themselves in order to deliver optimal patient care. She maintains a general internal medicine practice at La Familia Medical Center in Santa Fe. Martina Scholtens, MD, MPH is a family physician and clinical instructor with the Faculty of Medicine at the University of British Columbia. She worked for ten years at Bridge Refugee Clinic in Vancouver. Her book about this work, Your Heart Is the Size of Your Fist, was published in 2017. The recipient of the Mimi Divinsky Award for History and Narrative in Family Medicine, Martina writes to bear witness to patient suffering, to reflect on the work of doctoring, and to advocate for what her patients need. She recently moved to Victoria, BC to start a psychiatry residency. The University of New Mexico School of Medicine, Office of Continuing Medical Education is accredited by the Accreditation Council for Continuing Medical Education to provide continuing medical education for physicians. The Office of Continuing Medical Education designates this live activity for a maximum of 22.00 AMA PRA Category 1 Credit(s)™. Physicians should claim only the credit commensurate with the extent of their participation in the activity. 1. Practice at least four new written communication skills to enhance their writing. 2. Use reflection as a means to better understand their patients' experiences and to better communicate with their patients about these experiences. 3. Define burnout, resiliency, and wellness and identify strategies they can use to increase purpose and connection in clinical practice. For additional information, please contact HSC Continuing Medical Education & Professional Development at 505-272-3942 or HSC-CMEWeb@salud.unm.edu.